With the Panda ToolRoom, the combination of a Franka Emika with the Vision ToolRoom, you benefit from a mobile, collaborative robot. 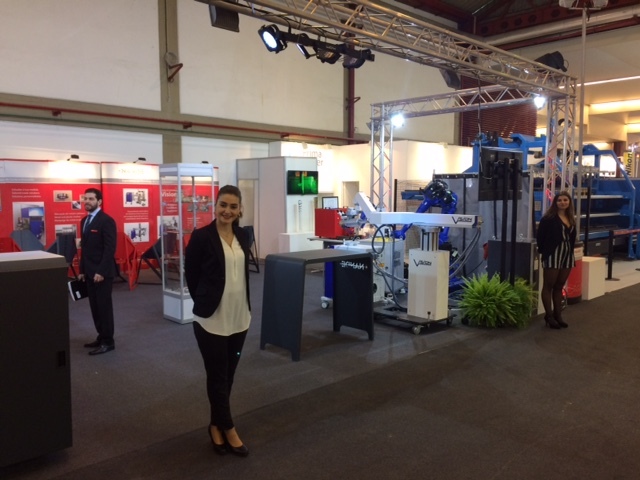 The fast setup allows, for example, the universal use of machines and systems for equipping and operation. With the Panda ToolRoom, the combination of a Franka Emika with the Vision ToolRoom, you benefit from a mobile, collaborative robot. The fast setup allows, for example, the universal use of machines and systems for equipping and operation. Vision got own street name. We got our own street name today! 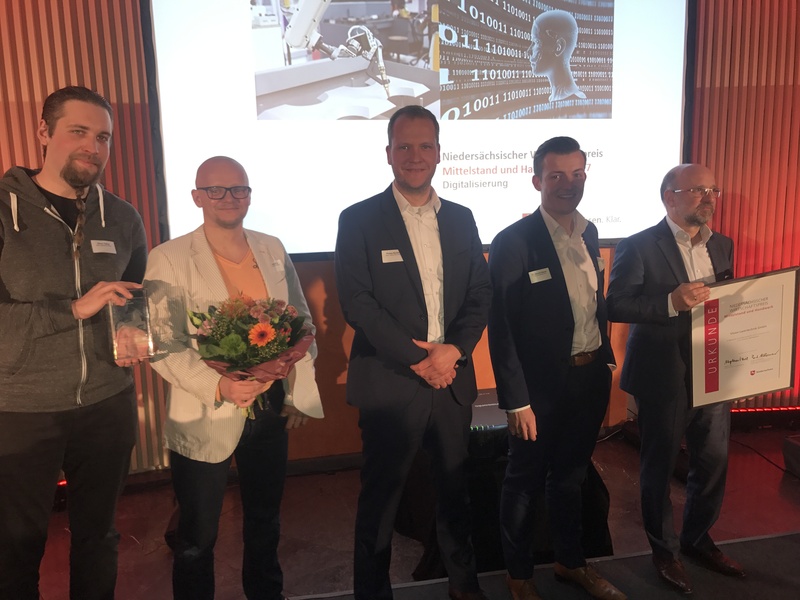 The Mayor of Barsinghausen Marc Lahmann today officially inaugurated the “Weg der Vision” (Way of Vision), the new corporate address of Vision. We got our own street name today! The Mayor of Barsinghausen Marc Lahmann today officially inaugurated the “Weg der Vision” (Way of Vision), the new corporate address of Vision. We are very pleased! 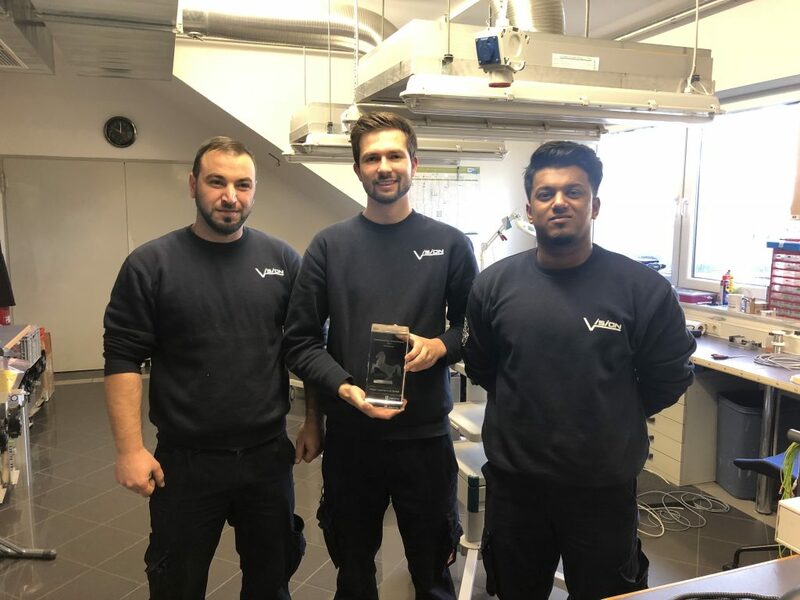 The digitalisation project “SmartFactory” by Vision Lasertechnik GmbH Barsinghausen has been awarded Lower Saxony’s Business Award 2017. 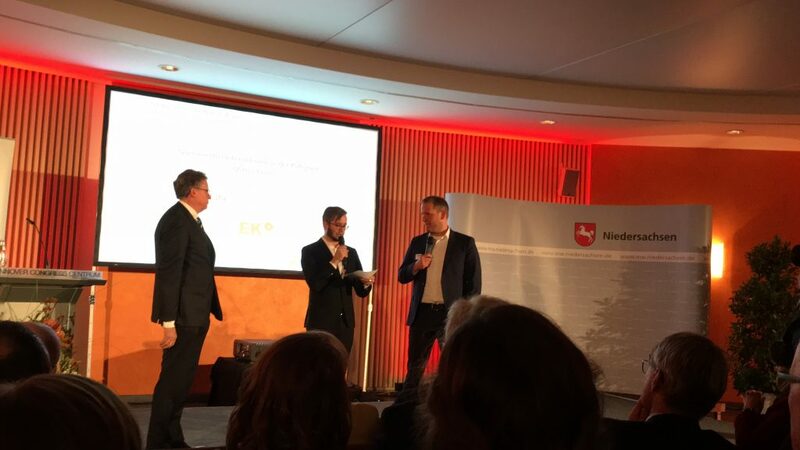 During a festive ceremony in Hanover on 28 November 2017, the commercial manager and authorised representative Philipp Becker, who is also project manager of the “connected production” working group, accepted the prize from the minister of economic affairs, Mr Althusmann. Vision was able to assert itself in the face of 40 applicants from all over Lower Saxony. The jury, which consisted of members of different organisations, associations and ministries, were convinced by Vision’s accomplishments. Dr Bernd Meyer (IHK Lower Saxony) praised Vision in his laudation and emphasised that the company “progressed incredibly fast” and “had realised in time where future chances lay“. He emphasised: “they were quick, they electrified the employees, they electrified the customers – They did everything right”. 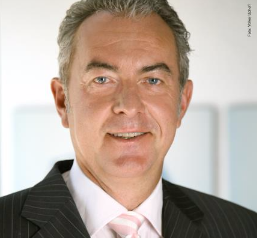 guest editorial: Prof. Dr. Krüger – What does digitalisation and industry 4.0 mean for small and medium-sized enterprises? SMEs to a state of shock. The necessary investments are lacking, as they are believed to be so far away from cyber systems, sensor technology, big data and the cloud. efficiently their business runs, as well as making sure they stay connected, as suppliers, for example. (industry 4.0), as well as to create newer and smarter products and to share and use data in realtime. can be used in numerous fields, including communications and entertainment, mechanics and road traffic and even healthcare. large part of the so-called “hidden champions” with the status of global market leader in the medium-sized sector. The vision of “batch size 1” is already part of their business model. are also ready to pay for this additional benefit. The possibility of deducing pointers to help design new services from user data, as well as that of developing new app-based functionalities, is seen as a chance for the high-tech industry, but not as a possibility for grassroots medium-sized companies. stolen and misused in the medium-sized sector. development, manufacturing and provision of services comes with considerable risks: expenses are difficult to calculate, and these must be juxtaposed with usage that is even more difficult to predict. industry is in involved in the digitalisation of its processes and products. external support, they have to find future avenues to suit their business. We wish you a merry christmas and we would like to thank you for the cooperation in 2016. Vision is closed from december 24th to january 1st. We will be back on january 2nd. We wish you a merry christmas and we would like to thank you for the cooperation in 2016. Vision is closed from december 24th to january 1st. We will be back on january 2nd. march 2nd – march 3rd 2017.
and to use and try all Vision systems. 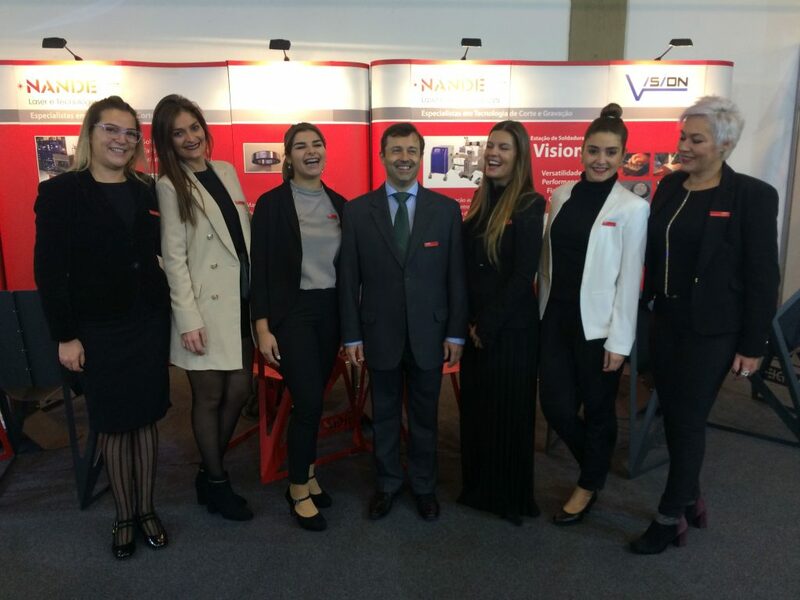 In cooperation with our portuguese Distributor NANDE Vision is proud to present the MobileFlexx II FSS on Emaf exhibition in Leça da Palmeira, Portugal. The exhibition opens from 23.11.2016 up to 26.11.2016. 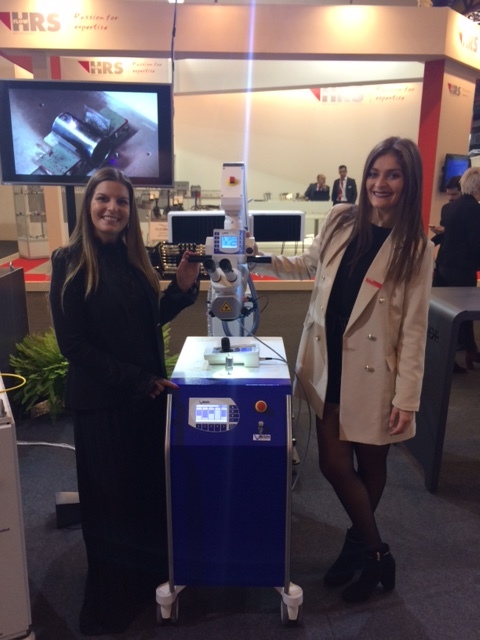 The MobileFlexx FSS is the most universal laser welding device from the Vision company. current or water cooling. That means that the device is ready to use on any environment. and tear nor service intervals. (one exception is the protective glass for the objective). Thanks for the great cooperation in 2015. We wish you and your family Merry Christmas and a happy new year. We are looking forward to a successful liaison in the upcoming year. Our german offices are closed for Christmas holidays from December 24 to January 3. We will be back on January 4. As part of the “smart factory ready” developments taking a unified Industry 4.0 approach the laser technology vision presents new possibilities for how previously non-networked machines and plants can become part of the smart network. For the first time a new technology is being presented now with which it is possible to transfer CAM data to machines without an Ethernet connection using the unified network, without the previous use of USB data carriers and associated problems such as incorrect revision statuses or the wrong datasets. The new “smartBox” vision offers a bidirectional and smart connection between the machine and the SmartFactory network thus allowing for the controlled data exchange of production data, order time recording and transferring sensor data. The open interfaces can be connected as standard to different SAP versions and modified to other systems too as per customer requirements. Production orders from ERP or MES can also be administered clearly, managed according to priorities, machine assignments or employee specifications and monitored in real-time using the unified administration surface. Experience the fourth industrial revolution with Vision Lasertechnik and revolutionise your work with state-of-the-art technology “Made in Germany”. With the new sMark, we present the perfect laser marker in the bottom price segment – the perfect entry into the field of laser marking and for the manual laser marking or small workpieces and tools. Thanks to the Microsoft Windows based software beginners are quickly able to apply perfect inscriptions and markings to workpieces. This unique technology makes it possible to supply pulsed fibre lasers with high pulse outputs at a competitive prices compared to flash-lamp pumping systems.